BHASVIC students have received an unprecedented 57 offers from Oxford and Cambridge this year. This is a significant increase from last year’s 39 offers and outperforms nearly all of the country’s top independent schools. Of the 57, 42 students gained offers from Cambridge which almost certainly makes BHASVIC the largest provider of students to Cambridge University. 15 BHASVIC students gained offers from Oxford; they will be studying 13 courses at 13 Oxford colleges. 23 Cambridge colleges made offers to BHASVIC students for courses as diverse as Medicine, Engineering and Music. The students in receipt of offers are drawn from 24 secondary schools stretching from Eastbourne to Worthing. 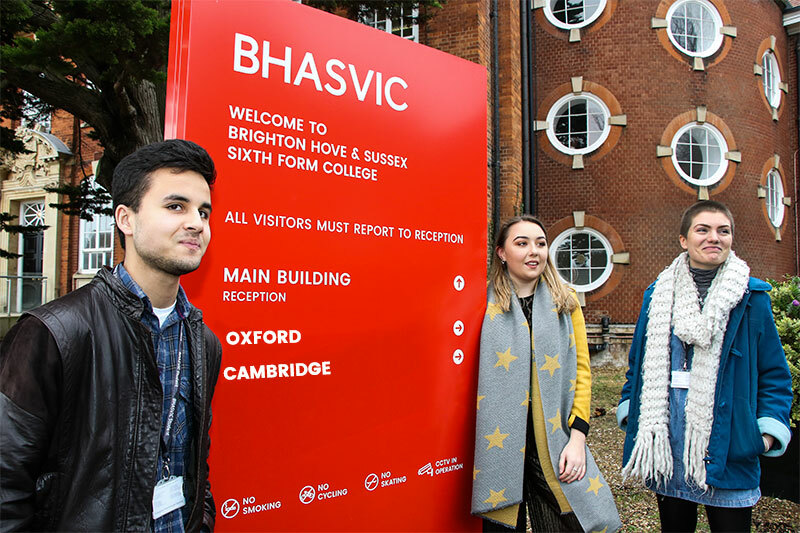 27 of the offer-holders are on BHASVIC’s Widening Participation scheme which aims to raise aspirations and provide support for University applications from its students who are from a non-traditional Higher Education background to ensure genuine social mobility. As part of this process BHASVIC seeks to work actively with local secondary schools to raise aspirations and ensure equality of opportunity for all. Mia Cook, who attended Shoreham Academy says she was not sure about going to university at all when she first started at BHASVIC. After meeting BHASVIC’s Oxbridge Co-ordinator at enrolment, Mia considered applying to Cambridge with the aim of pursuing a future career in educational policy with UNICEF or the Civil Service. For Mia it all seemed daunting at first as her parents didn’t go to university, but as the family received more information from BHASVIC about the Oxbridge application process it all became clearer and much less stressful. Yassine Rachid attended St Catherine’s College in Eastbourne before joining BHASVIC. He has always been fascinated by faraway galaxies and complex machinery and is looking forward to the opportunity to study Physics at Oxford, including the challenge of studying with world class physicists. Multi-lingual, with French and Arabic spoken in his family home, Yassine is the first one in his family to go to university. Studying Physics, Maths and Economics A levels at BHASVIC, he values his teachers’ focused support and the college’s approach to learning which empowers students to learn subject content outside the classroom allowing time to apply concepts and engage in creative, interactive learning within the classroom. Elinor Hollis, also from Shoreham Academy will be the first student from BHASVIC to study Linguistics at Oxford and says that teachers at BHASVIC have helped to build her confidence and belief in her abilities. Her interest in the study of words and the complexity of grammar, kindled by A levels in Spanish, English Language and Law, have led to her wanting to study linguistics at university. BHASVIC’s Principal, William Baldwin said: “To get 57 Oxbridge offers is – put simply – a staggering achievement. This is not down to coincidence or luck – a lot of work goes into our specialist Oxbridge tutor pathway to raise aspirations and prepare students for the application and selection process. We must pay testament to the role our local schools play in this process - excellent GCSE results are one of the first things that the admissions teams at all leading universities will look for, so our partner schools should be rightly proud of these outcomes too. I wish our students luck as they work hard towards their exams to secure their offers. That goes to all our students, regardless of their destination. It’s important to remember it’s not all about Oxbridge. For subjects like Media and Film, getting into a university like Bournemouth is the equivalent of getting into Oxford or Cambridge. It is just as challenging to gain an offer from Imperial for a subject like Engineering. Equally, Education students will look to Durham or Glasgow with aspiration. Our Sports Scientists are rightly striving for places at Exeter and Birmingham. It is our specialist knowledge and staff expertise that helps guide individual students to the right destination for them - and that is most important”. Local schools are actively working with BHASVIC to raise teenage aspirations – this year BHASVIC students achieving Oxbridge places previously attended the following state secondary schools: Blatchington Mill (5 students), Cardinal Newman (2), Cavendish School (1), Chailey (1), Chatsmore (1), Davison’s (2), Dorothy Stringer (9), Downlands (5), Hove Park (1), Lewes Priory (9), Longhill (1), Oakmeeds (4), Oathall (1), Patcham High School (2), Kings Academy Ringmer (1), Seaford Head (1), Shoreham Academy (2 students), St Andrews (1), St Catherine’s Eastbourne (1), Varndean High School (1), Worthing High (1). Students from local private schools, including Brighton College and the Girls’ High School also gained offers.